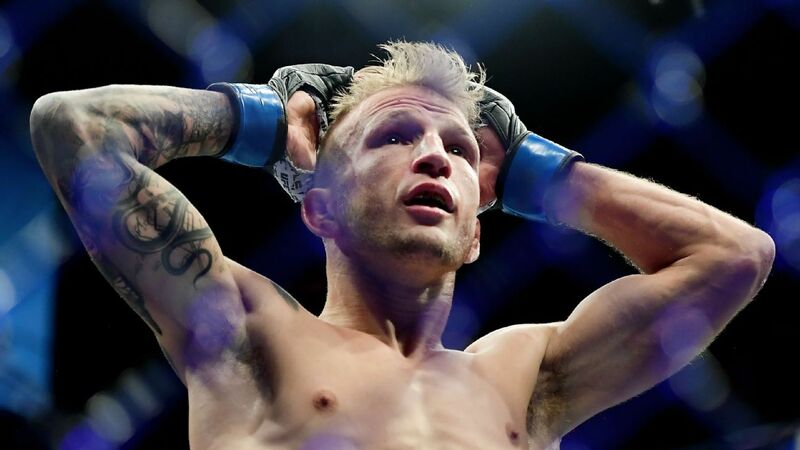 T.J. Dillashaw has voluntarily relinquished his UFC bantamweight championship after he was notified of an “adverse finding in a test taken for my last fight.” The 33-year-old Dillashaw announced the news on his Instagram account. He dropped down to flyweight in January to battle Henry Cejudo for that belt, losing the fight in 32 seconds, which was the fight he tested positive for. Dillashaw won back the the bantamweight title at UFC 217 with a win over Cody Garbrandt, then defended it against him again at UFC 227. Dillashaw is 16-4 and has become one of the bigger draws in the UFC. The fight against Cejudo was almost specifically designed to make Dillashaw a two division champion. The New York State Athletic Commission claims it has suspended Dillashaw for one year and fined him $10,000 for “violations relating to the use of a prohibitive substance.” The suspension will be retroactive to January 19, the date of the Cejudo fight.